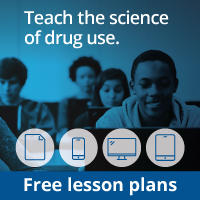 After developing the lists, help the students understand the differences between legal and illegal drugs. Many legal drugs, such as medications, are helpful but must be taken carefully, in the right dosage, and under the right circumstances. Some legal drugs, such as cigarettes and alcohol, may be purchased only when individuals reach a certain age (e.g., an individual must be at least 21 to purchase alcohol in the United States). Illegal drugs are all harmful in some way, and illegal for everyone. Have the students watch the DVD. Stop the DVD at the break. Now that the students have an idea of the kinds of drugs commonly used, give them an opportunity to find examples of them in the popular media. First, decide if you want the students to work in pairs or in small groups. Then organize the class accordingly. Tell the students that their mission is to create a scrapbook showing how drugs are presented in the media. The scrapbook should include examples from newspapers, magazines, the Internet, television, and movies. Be careful to select media that are appropriate for this age group. Some media may contain images that aren’t appropriate for children this age. Give the students class time to work on their scrapbooks. Pass out the magazines and newspapers and have them look for pictures to include in their scrapbooks. The students can also check on the Internet for examples. With their groups, they should brainstorm on how drugs are portrayed in the movies and on television. After the students have completed their scrapbooks, watch the remainder of the DVD segment. At the conclusion of the DVD segment, have each group make a presentation to the class. During the presentations, ask the students questions, such as: Was it difficult to find pictures of drugs commonly used? Where did you find cigarette ads? Where did you find alcohol ads? Why do you think these kinds of media advertise these substances? Then conclude the activity by discussing the similarities and differences among the scrapbooks. What features do all the scrapbooks share? How are they different? Tell the students to keep their scrapbooks to use in later modules. Discuss with the class how drug use is portrayed in the media. For example, what do the people drinking or smoking look like? Are they well dressed and attractive? Are they engaged in an appealing activity, such as picnicking in the park, or laying on the beach? Ask the students if they think these images make drug use more attractive to young people. If so, do they think that the media contributes to drug use in our society? After the students have watched the DVD, discuss the question that Corty has posed: Why do they think that people take illegal drugs, even when they know that they are bad for them? Create a class diagram showing the similarities and differences between how drugs are portrayed in print versus other kinds of media. Does one kind of medium portray drugs more positively or negatively than another kind? What conclusions can the students draw by analyzing the diagram? NIDA. "Brain Power: Grades 4-5." National Institute on Drug Abuse, 1 Sep. 2012, https://www.drugabuse.gov/publications/brain-power/brain-power-grades-4-5. NIDA. Brain Power: Grades 4-5. National Institute on Drug Abuse website. https://www.drugabuse.gov/publications/brain-power/brain-power-grades-4-5. September 1, 2012. Make your own T-shirts, Stickers, and Buttons.